It seems to be an obvious fact that a child can’t choose their parents, we are born into the world by two people and there is no changing that. But unlike most, I had the rare opportunity to choose another parent to add to my family. Her name is Maureen, she started out as my neighbor and after school baby sitter and now she introduces me to people as her daughter. She is my mentor, my guru, my friend, and I would be a very different person if she hand’t entered my life. I started going to her house every day after school in fourth grade, it was here I realized my passion for art, and it was then that Maureen became my teacher. As the only artist in my family, I claim that I became an artist through osmosis after all those afternoons at Maureen’s house. Our mutual affection for art placed my firmly under Maureen’s wing, she became what I called my “art mom”. She began taking me to galleries and cultural centers, teaching me techniques and giving me projects. But amidst all her lessons in art, Maureen was teaching me about something just as important…life. Over the years she taught me how to read people, how to be confident, how to be strong, how to express myself, and how to have faith in the universe.Yes, the universe…here’s the concept; the universe is always working, guiding you in the right direction. Faith in the universe teaches you to never panic when things feel out of control, because you have to believe that there is a reason for it all, an end purpose that you’re moving towards. And all of the struggles that you encounter in life are conquerable because the universe is always unfolding as it should. When Maureen started teaching me about the universe, I didn’t think any of it applied to me. I didn’t have struggles, I didn’t need strength, and didn’t need faith that it would all work out…until I did. Sophomore year of high school was the beginning of the hardest few years of my life. Everything in my world seemed to fall apart all at once and I couldn’t seem to carry all of the pieces. I lost my best friend when he went to college and decided he didn’t need me anymore. I lost my family when my parents told me they were getting divorced out of the blue. I lost my home when my parents couldn’t live with the memories anymore. And to deal with all this my outlet was running, but I lost that too when I got injured and underwent two consecutive knee surgeries. It was obvious to me now what I was in need of some serious faith in the universe. Through all of this Maureen had been by my side; listening to me, taking me out of my house when I needed to get away, being my mom when mine was dealing with her own troubles, and continuing to teach me. It was during this crisis in my life that Maureen introduced me to The God Jar. It was a clay jar she kept in her dinning room with a stack of post-its beside it. She told me that when something in life seemed too much to bare, beyond your control, or impossible to to handle alone, you write it down on a post-it and put it in The God Jar. It was a way of taking the burden from your shoulders and handing it to the universe. Once your trouble is in the jar, the universe will take over, guiding you through the hardships. 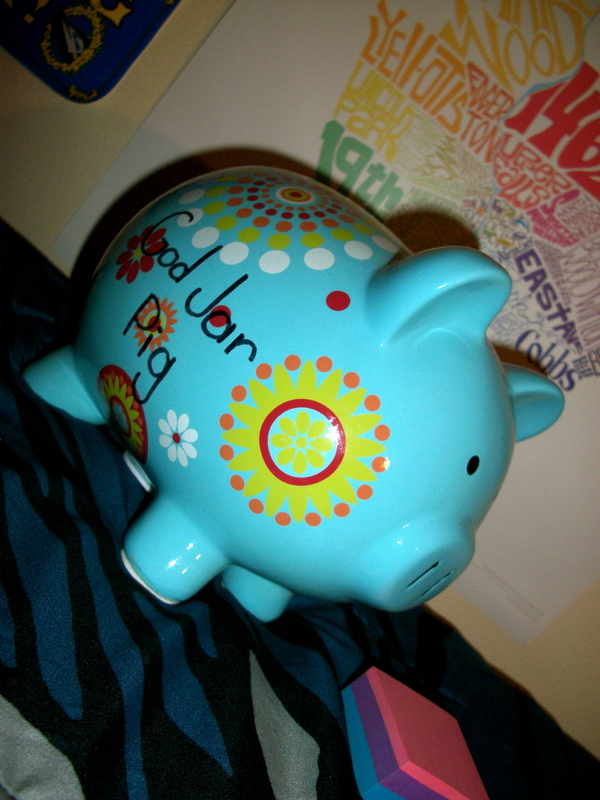 I used Maureen’s God jar quite a bit over the years, and one day I found this blue piggy bank sitting on my front porch with a stack of post-its and a note. It said “your very own God Jar, use it wisely and often, Love Maureen”. And I do exactly that. My God Jar Pig, as I call it, sits on my desk here at school and it will follow me wherever this life takes me. Almost daily I write down my fears, goals, dreams, prayers, and anything else on my mind and put it in the pig. People ask me about my pig all the time and I tell them how it works. Some think its strange, some ask to try it, some want one of their own, and some ask me if it works. That I am not entirely sure of, but I know that when I drop a burdened post-it into my pig I feel my load being lightened and I have to believe that the universe is watching out for me even in the smallest of ways. Maureen and her teachings were there for me during some of the hardest times of my life, The God Jar was my bible and she was my church. And to be honest, I think she may have saved me. My God Jar Pig is a very special possession of mine because it is a constant reminder of Maureen and all that she has helped me through. But more importantly, it is a reminder of how she taught me to help myself. 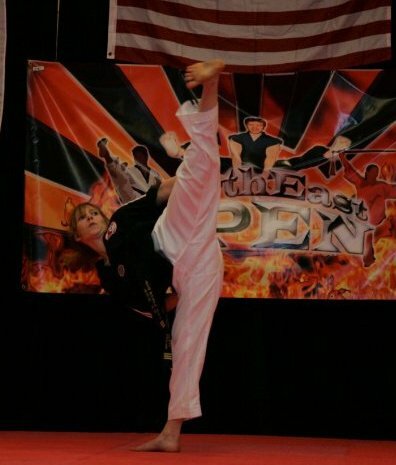 When I was four, I wanted to be a ninja- mostly because I wanted to be just like my older brother Robert, who had started martial arts two years before. I’ve always been a shy person. I would stand in the seating area of the dojo, watching the class and following along. My Mum kept asking me if I wanted to do the class. “Nope”, I’d say, shaking my head. Yet every night I’d beg to get taken along to class with Robert and I’d follow along with the lesson. Then at home, Robert and I would practice in our living room, and he would correct my stances and my techniques. Eventually, we reached an agreement- I would enroll if my Mum did as well. That Monday, I started class… and never stopped. I love my belt. It’s got my name in English on one side and my name in Korean on the other. However, the Korean is completely incorrect. For some reason, I absolutely love that. It makes it perfect. 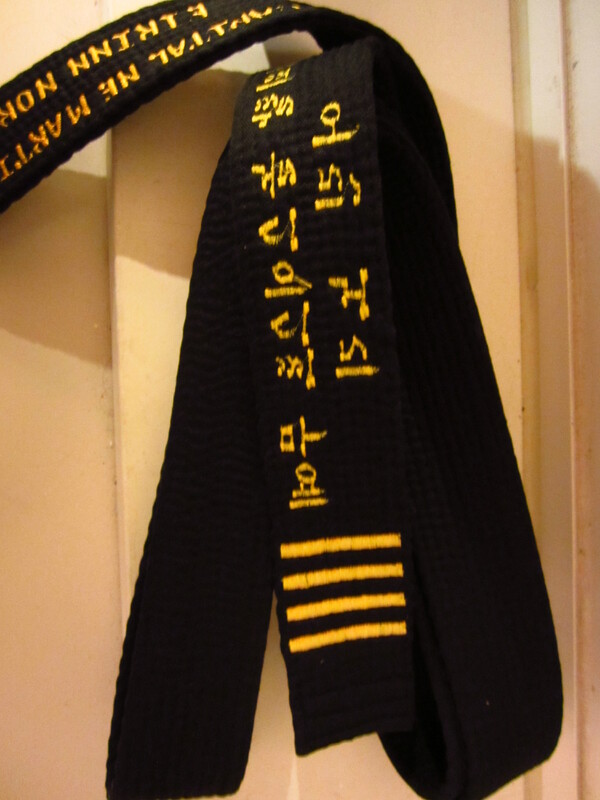 My belt is an identity. I don’t have to be shy when I wear my belt. In fact, it’s almost impossible to be shy when it’s wrapped around my waist. I’m not exactly sure why it has that effect on my personality. It may be because I know I’ve worked hard to get it, therefore I feel “worthy” when I wear it. Perhaps it is because people see me not as an ordinary girl, but as a role model. Whatever the reason, my belt is a source of confidence. I’ve always loved keys. As a child, I had been given various diaries with lock and key- but I never felt the need to write in any of the journals. I only wanted to lock the journal, keep the key safely in my pocket, and unlock it at my heart’s content. Over the years I have given up on diaries, but my affinity for keys still remains. I have had several key necklaces and charms through out my adolescence, one being a small key necklace with a purple stone. One day, while working at the Staples in my hometown, I was ringing up a man who complemented my necklace and asked what it meant to me. I explained that it had no significance, that I just liked keys. He replied, “one day you’ll find out what it means to you” and as he handed me the tender, I noticed a key tattoo on his hand. Of course, I pondered the significance of the key for many months. After a number of events in my life, I believe I have found it’s meaning to me, or at least in this stage of my life. I consider the key to be a constant reminder that I alone hold the key to my own happiness, success, and life in general. If there ever is a time when I am unhappy, it will remind me that I alone can change that. If there ever is a time when I feel as though my life is not on track, the key will remind me that I alone can get it on track again. Today, I wear this key. Unlike all the others, it was not given to me as a gift. It was a key that I chose. I was wandering through the shops of New Paltz during my first semester when I came across a rack of all different types of keys, about two inches tall, with several different words engraved in each. This particular one has the word “wish” engraved in it. However, I must admit that this key was not chosen for the expression it displays. It was chosen because of its style- the twists, turns and elegant curls. It was chosen for its antiquated finish and profound essence. I have worn it every day since then. 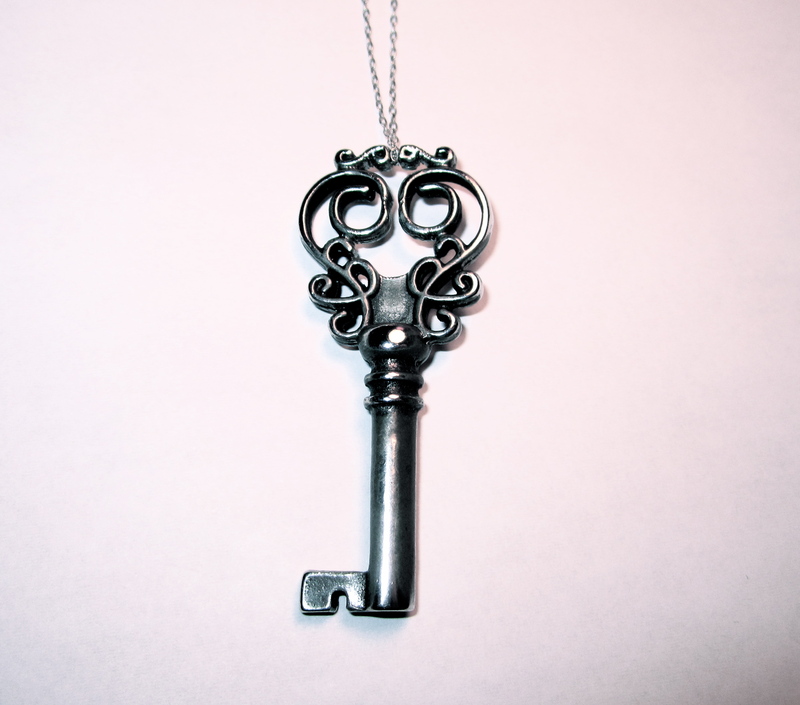 I intend to have a key quite similar to this tattooed on my foot with the words “I hold the key” in fancy cursive. The placement of this tattoo has been a constant battle, because it must be perfect. I decided on the foot because it will be a place that will not be mistaken for a particular key of chastity, and because it will be in a place that is both subtle, yet perfectly capable of being seen when I need to see it. When I finally have the money to get it, I will think back to the man who found enough significance in a key to get it tattooed on his hand. This necklace has received many compliments in the two years that I have worn it, and everyone always asks what the key opens. Although I never give such an abstract answer, I like to think that this key unlocks my deepest ambitions, without my ever knowing it. Hi everyone! 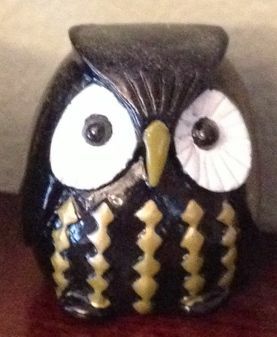 I’m going to do my first blog post about an object (rather, a set of objects) that I didn’t bring to our first class. Pictured above are my Positive/Negative rocks, which hold a lot of sentimental value to me although they were only given to me fairly recently. Each rock is about an inch and a half long and very smooth. While they are chipped in a few places, the Mediterranean Ocean rid them of all of their rough patches, so even the places that are chipped have rounded edges. The white is my Positive rock and the black is my Negative rock. My Positive rock is slightly smaller and flatter than my Negative rock and curves inward on both sides, which makes it feel as if someone else had already been rubbing it between their fingers long before it came to me. My Negative rock is rounded on one side and flat on the bottom, generally larger than the other rock, and so feels heavier when you hold in it your hand. I regularly rub oil into both rocks, which keeps them smooth and makes them smell like jasmine. The smell is particularly important for me because it reminds me of my best friend Lauren, who gave me the rocks, because she was the first person to put jasmine oil on them while we were in France. The first time I saw a pair of Positive/Negative rocks, I was in Lauren’s room in Montpellier, France. She has a pair that she found on the beach in Barcelona, Spain, a long time ago, and I asked her what they were for. She explained to me that she uses these rocks to meditate: whenever she’s feeling very negative, she meditates over the black rock, channeling all of her feelings into it so she can keep an open mind throughout the day. Contrastingly, whenever she’s feeling positive, she’s gives a little energy to the white rock to save for a rainy day; this way, when she’s feeling down, she can draw some good energy from her Positive rock after she channels her negativity into the black rock. I was really interested in these rocks and spent a lot of time asking her if they really worked. I hunted for a pair a couple times at a beach near our city called Palavas les Flots, but I never found any good ones. All of mine were different shapes, sizes, were rough, or just didn’t seem to fit together well. A few months later, Lauren surprised me by giving me my very own set of rocks that she had collected on the beach in Nice, France. For these reasons, these rocks are very important to me: they were given to me by my best friend, they are from France (my favorite place in the world), and they help me balance my feelings when I start to lose control. Another aspect of my set of rocks that I really like (compared to Lauren’s, which are pure black and white) is that both my Positive rock and my Negative rock have flecks of the contrasting color. My black rock has tiny dots of white, and my white rock has tiny dots of black. Whenever I meditate over my rocks, I try to remember that like them, life is never 100% positive or 100% negative; rather, it is whichever you choose to focus on the most. 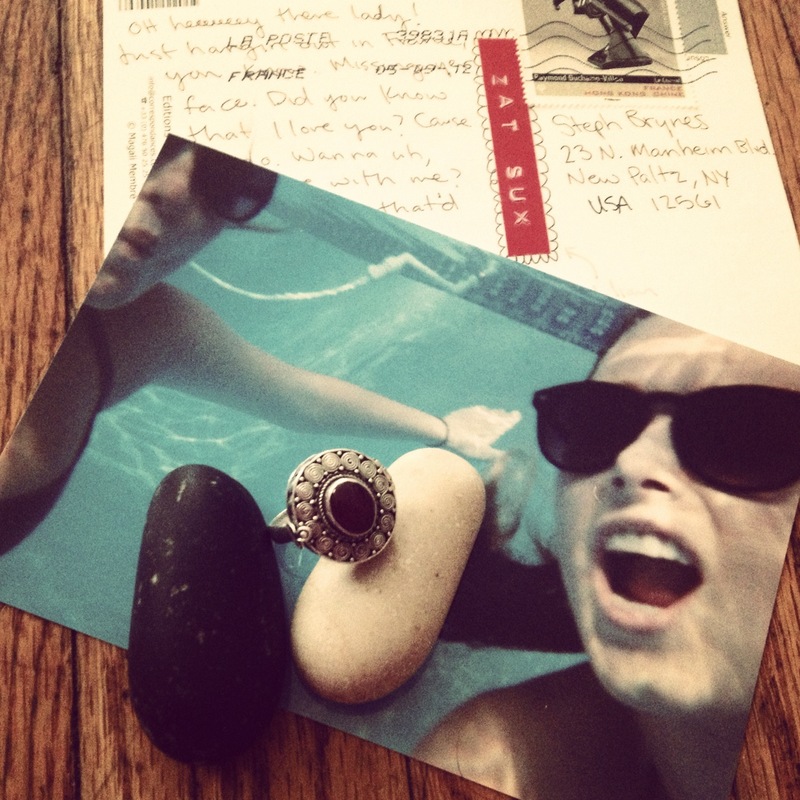 As one last note, the other objects in the photo above are one of Lauren’s rings, a photo of the two of us, and a postcard she sent me from France when she visited over the summer. My inpiration for this course came from reading Edmund de Waal’s The Hare with Amber Eyes, a book that we will be studying in this class. The text is remarkable because it tells the story of a family not by psychoanalyzing personalities but through looking at objects–a collection of Japanese Netsuke (small handcrafted figurines) to be precise. We get an amazing view of who this person is and where he comes from because of the stories that these objects contain. It is my hope that we can find out more about ourselves, our community, and our scholarship by looking to the stories held by the objects around us. We will be using our “reading” of things (some simple and everyday, some more elaborate) as an avenue to personal stories, collective histories, and new approaches to our scholarly work. I am very excited to see where these searches will take us over the course of the term!